Chef Rocco Lugrine was born and raised in the city of Philadelphia. His career in the food industry began at an early age. 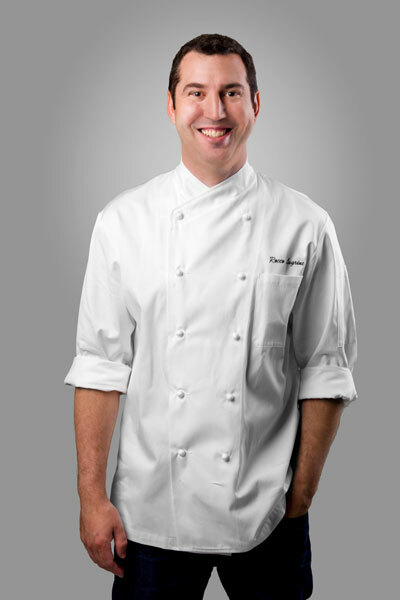 Chef Lugrine graduated from the Restaurant School at Walnut Hill College in 1993. Immediately following graduation he began his career cooking in legendary fine dining restaurants such as Chanterlles and Le Bec Fin. By the age of Twenty-two Rocco has had the privilege and honor of preparing food for such culinary icons such as, Julia Child, Jacques Pepin, & Paul Bocuse. Chef Lugrine is the recipient of many local awards such as 6 best of Philly awards, people’s choice, and he has also been selected as one of the top people to watch in the new millenium. In addition, to cooking Chef Lugrine has written articles and has been featured in magazines such as Bon Appetite, Pastry Art & Design, Chocolatier, & Fine Cooking. After receiving all of this notoriety at such an early age Chef Lugrine decided to give up pastry making for a few a years and moved to San Francisco to learn the art of Bread Baking. Chef Lugrine returned from California after a three year stint and landed a job as an executive pastry chef for local pastry shop ,Miel, that serviced over 100 outlets in the tri-state area. Here He had the privilege to prepare food for the actors and a few of the scenes in a movie named The Village. After five years at Miel, chef Lugrine was asked to return to Le Bec Fin, but this time to oversee the operation as the Corporate Pastry Chef. Chef Lugrine oversaw the opening of two new restaurants as well as managed and trained the staff at all five restaurants. In 2008, Chef Lugrine left this position after a few years and the birth of his first son, to begin teaching at The Art Institute of Philadelphia. He is currently a culinary instructor and an Ambassador for Barry-Callebaut. Chef Lugrine still reside in Philadelphia with his wife and two boys.